Noctowl in game: 563 Who? Important notice! Pokemon Noctowl is a fictional character of humans. 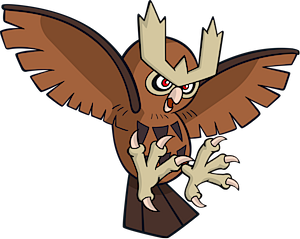 Noctowl bears similarity to an owl with brown plumage and has a darker brown triangle pattern of feathers running down its chest. 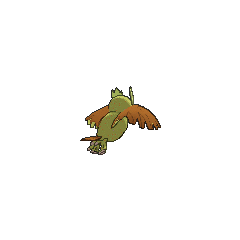 Its wings and wedge-shaped tail are dark brown, while the undersides of its wings are light brown. It has bushy, cream-colored feather 'horns' that look similar to a trident or eyebrows. 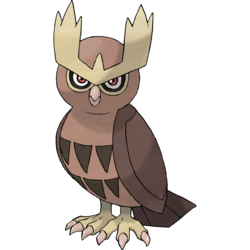 The ring pattern around its eyes and its talons are cream colored, and Noctowl's beak and talons are light pink. Additionally, Noctowl has large, red eyes. 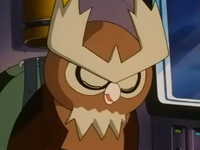 As shown in the anime, Noctowl can grow a small beard in its elderly stages. Noctowl is a nocturnal Pokémon. It has exceptional hearing and eyesight, can fly silently, and can turn its heads at a 180° angle to increase its intellect. Noctowl is most commonly found nesting in trees and forests. Noctowl first appeared in Fowl Play!. A man was trying to capture the smaller, Shiny Noctowl by using traps, but kept failing due to the Owl Pokémon's intelligence. After Team Rocket was sent flying, the Noctowl allowed Ash to have the chance to capture it. After an intense battle, Ash succeeded. Wings Alexander also has a Noctowl, as seen in Throwing in the Noctowl. A Noctowl appeared in A Relay in the Sky!, under the ownership of Ornithol. 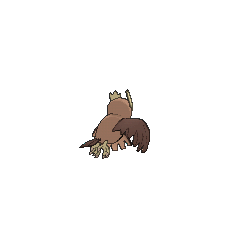 Several wild Noctowl also appeared in Fowl Play. A Noctowl appeared in For Ho-Oh the Bells Toll!, One Team, Two Team, Red Team, Blue Team!, and Aiding the Enemy!. A Coordinator's Noctowl appeared in Going for Choke! participating in the Battle Stage of the Mulberry Contest. A Noctowl appeared in Pursuing a Lofty Goal! belonging to a participant of the Squallville PokéRinger. Multiple Noctowl also appeared in Diancie and the Cocoon of Destruction. 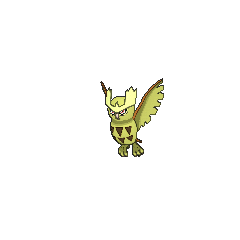 Noctowl is seen as one of the Pokémon under Falkner's ownership which it first appeared in Sunkern Treasure trying to catch a Skarmory. Cyrstal mentions she captured a Noctowl on her way to Professor Elm's Lab in Three Cheers for Chikorita. 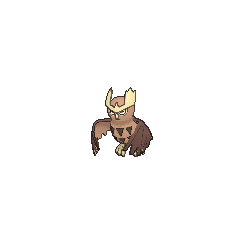 In The Last Battle XIII a Noctowl was one of the Pokémon sent to help the fight in Ilex Forest. Noctowl's appearance is based on that of the Horned owl.